The basic idea is to have increasing waves of enemies and to take orbs to get new weapons to increase the score multiplier. 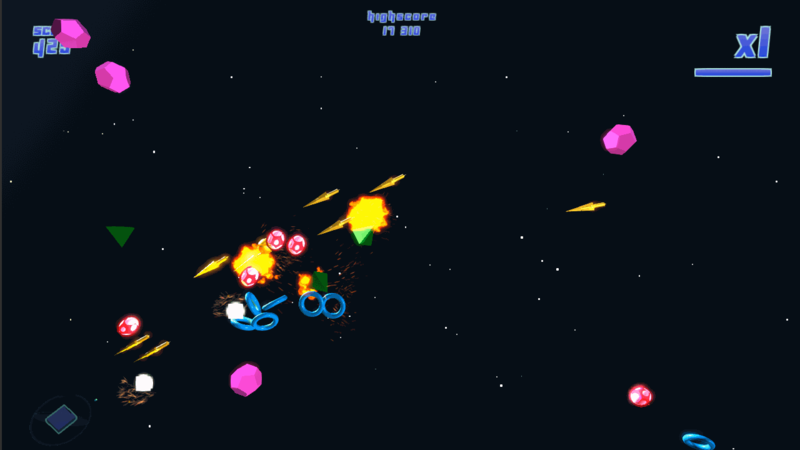 There are still many things to do: more enemy types, more weapons and more juice. Each enemy has a different score value depending on how much danger they represents. Each time you take a weapon orb you get a new weapon, good or bad. It increments the score multiplier and reset it's timer. When the multiplier timer reach its end, the multiplier is decremented. Last edited by bombjack on Wed Nov 29, 2017 2:04 pm, edited 1 time in total. Re: D.O.T - Enemies are welcome! All the enemies are now in the game! After viewing What We Can Learn From Doom, I wondered how I could transpose those ideas to my shooter game. The action in D.O.T takes place with the succesion of enemy waves. The different waves are designed to either provide challenge or make the player learn something about the enemies behaviours. If you don't clean the wave fast enough, another one appears and you could easily get overflooded. Each Doom unit has very distinct characteristics that differenciate it from the others. That's part of what makes the experience so rich and joyful. The zombie man has a hitscan weapon and is quite hard to transpose to D.O.T. The player has only one health point which nearly prohibit the use of hitscan weaponery. I replaced it by a wanderer hexagon that just moves on the screen without caring about the player. He is as ennoying as the zombie man which is its main purpose. The imp fire bullets and moves quite slowly toward the player. It exists to force the player to move to avoid bullets. It's perfect for my game where it takes the form of a green gunner triangle that tracks the player and force him to keep moving. The demon hunts the player and do melee damage. In D.O.T., the chaser donut moves fast to the player and kills him instantly. The yellow speeders appear in packs of at least 5 and move very quickly in straight line. Just like Doom's lost souls does. The hollow sniper cube incarnates the cocademon. It stays back and fires a nearly constant flow of bullets. You'd better kill it quickly or prepare to die. To add more precision, it targets the direction you're heading. Deadly! The little red bugs are enemies coming in flock chasing the player. It doesn't move directly to the player. It kinda orbitate around the player to kill it. Just like the speeders, they appear in their own waves; without any other enemy. It provides a short time of relief just before adding more tension when you see all those bugs charging at you. The combination of all those mechanics offers a wide palette of possible encounters. It encourages the player to think fast and act fast. I've released a video for the beta gameplay.